As an expert in your field, influencer or business owner, you’re faced with the responsibility of writing content for your followers. Sure you can write catchy and witty social media posts, but writing an ebook is a whole other game. While ebooks have a lot to offer, for beginners the thought alone can be overwhelming, and the writing process a mystery. You’re probably now kicking yourself for not having paid attention in your English classes thinking that you’d never be an author. Don’t worry. Today we’re bringing to you the lessons you wish you paid attention to and the methods used by successful authors of ebooks. We’re breaking down the steps, to make writing an ebook easy and fast, and so in the end, you’ll be proud of your ebook content. This article does not cover the layout templates, the book blurb, the interactive content, nor publishing and selling. Those topics are covered in other articles. Today we’re focusing on the writing. Anyone can be a successful published writer. Many people have done it before, so there’s nothing keeping you from doing it, too. There are basic steps, followed by authors around the world to make it happen. These steps are specially designed to not only help you get your ideas on paper, but also to work past writers’ block, and finish your ebook quickly. So what are those famous steps? And then you’re all ready to publish (which is a whole other adventure of its own). See our step-by-step guide to self-publishing ebooks. 1. Identify your ebook’s objective and target audience. What are they looking for when they read your ebook? 2. Research and generate ideas. Keeping your goal in mind will help you focus throughout the process. Before you set pen to paper, start with researching the topic. The research will generate valuable ideas and content. For many, research is grudgingly associated with old school reports. I’ll let you in on a little secret, the best novelists perform exhaustive research to create stories that are authentic and true to the voice of their characters. Even experts in their field, need to research the intended topic, to make sure they’re not overlooking new developments and related topics of interest to their readers. At this point, you’ll have a head full of ideas, some well organized and others resembling a teen’s bedroom. How you sort through them and write out a plan is really up to you. Traditionalists like myself find comfort in the structure of the old-fashioned Roman numeral outline. Many authors prefer more fluid techniques like mind-mapping. Regardless of your preferred style, there are four main stages. Write down the main ideas. Determine what the main ideas are and jot them down. Now while the ideas are fresh, write down the subtopics for each of the main ideas. Later when you start writing, you may forget many of the brilliant ideas that came to you while researching: the examples, the diagrams, sometimes even the ideas themselves. Put the ideas in order, first topic to last topic. Decide in which order they should be presented: chronological, problem-solution, etc. Perhaps the most important question now lies in what to include and what to exclude. Even if you’re writing a textbook, there will be topics to eliminate to keep your book digestible for your readers. Remember the goal of your ebook, determine what you need to include to achieve your goal, make sure you haven’t forgotten anything, but add nothing else. Some people don’t see the reason behind an outline, but it really does help keep you on track as you work. You may need to alter the outline, and that’s fine. Having a plan keeps you and your ebook focused and thorough. Now that you have an idea and a solid plan of action, it’s time to write your first draft. It doesn’t have to be perfect by any means, you can fix it up later, but getting everything out on the proverbial paper is our ultimate goal. But where do you begin? 4. Write the main ideas. The main ideas will form the backbone of your ebook. It is essential that they are well-written and easy to understand. 5. Support them with details, facts, examples, anecdotes. Support the main ideas with all the necessary details, facts, examples or anecdotes that can help your readers understand, visualize, and apply your message in their lives. 6. Check in with your outline. It’s easy to get caught up in the writing, so much so, that you forget what you had set out to do. Check in with your outline regularly and make sure you didn’t forget anything. 7. Write the intros and conclusions. Finally, go through each main section and write those gripping intros that will grab the attention of your readers, and the conclusions where you wrap everything up. Perhaps the biggest mistake first-time authors make is to start with the intro. It would seem logical to start with the beginning, but it usually ends up being counter-productive. People sit in front of their screens waiting for their hidden muse to emerge from the dust, or on the opposite end of the spectrum, they start madly typing out catchy phrases only to delete them later. It’s hard to introduce something that doesn’t yet exist. As you write your ebook, it will change as will each section within it–both the content and style will change. So save the introduction for last, when you finally know what it is you’re introducing. 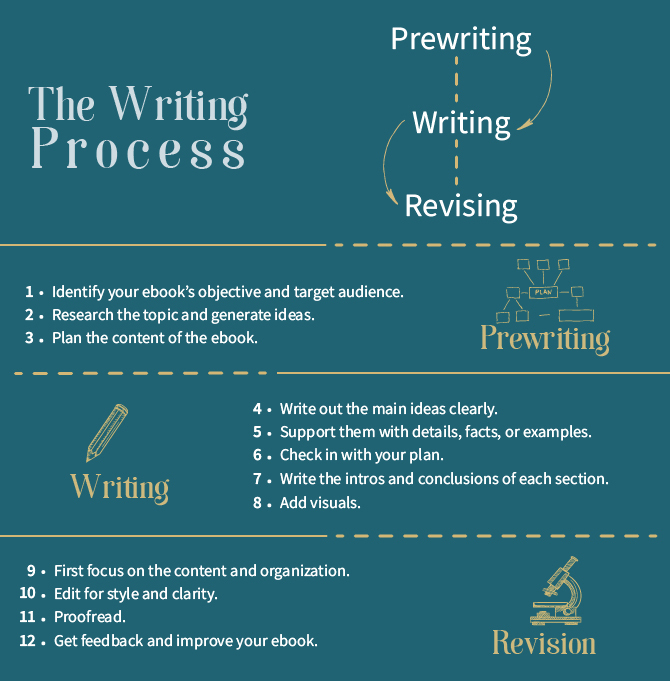 While this may not be part of the “writing process” per se, it is a part of making your ebook easy to understand and a joy to read. Most people are visual and enjoy a break from the constant reading. Illustrations, graphs or even videos are added to the mix for variety, aesthetic appeal and often to drive a point home. Be sure to check out The Ebook Author’s Guide To Images. This is the point where you go back to what you’ve written and try to improve it. Don’t waste time with your spellchecker quite yet. There’s some higher level revising that needs to be taken care of first. Let your ebook rest for a few days, then come and read it as if it’s the first time you’ve seen it, as if someone else wrote it. 9. First focus on the content and organization. Make sure the content is complete and that main ideas follow one another logically. See if the current structure works or if you’re in need of a different overall format. Turn a blind eye to any grammar and spelling mistakes. This stage of revising is reserved for analyzing the organization of your ebook at the level of sections and paragraphs. 10. Edit for style and clarity. Now that you’re sure the content is in the right order. Start reading for style and clarity. Try reading your ebook aloud. Pay attention to the phrases where you stumble. That’s probably what your old English teacher would have marked as awkward, and the sentence needs a little work. Turn your grammar checker on now and make sure you don’t have any grammatical errors. This stage of revising is reserved for the paragraph and sentence level, so the flow of your work sounds smooth. Finally, turn on that spellchecker. Most spellcheckers will pick up double words like “the the” that happen when you copy-paste and move sections around. Remember some spellcheckers won’t pick up typos that result in a real word, such as bail and ball. With smaller texts, we recommend reading it backward to find these funny typos. However you go about it, as you go through this time, you’re paying attention to the finer mistakes, at the word and punctuation level. 12. Get feedback and improve your ebook. The final and possibly most important step is to get feedback from others. You’ve gone through and made sure your ebook is thorough, easy to understand, as well as, beautiful and smooth on all levels. Now, it’s time to ask for someone else to step in and see it with fresh eyes. It may be hard to listen to a different opinion or god-forbid criticism. But that is how you’ll make sure that your ebook will appeal to a wider audience, than just you. If you’re scared of what others might say or find criticism painful check out our tips for how to deal with criticism as a writer. Self-editing might seem like a complex step, and we’re not going to lie, it’s not an easy one, but it’s not an impossible one either. For some basic tips, you can refer to how to become an amazing self-editor. 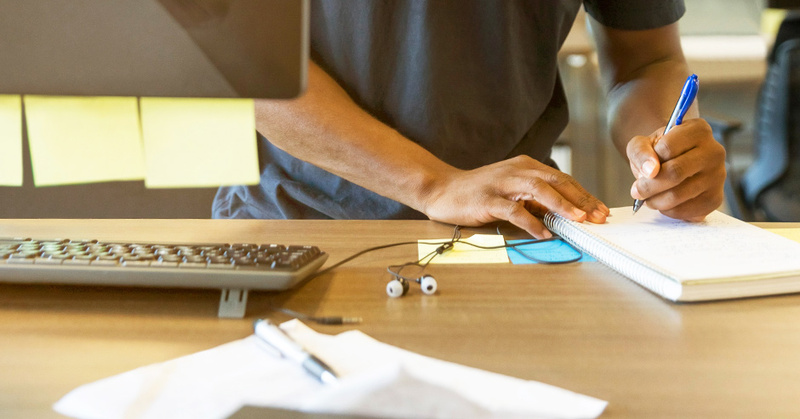 However, if you’re still having problems with editing because of an underlying perfectionist streak – don’t worry, we’ve all been there—here are 7 tips for perfectionist writers to help ease you out of it and get the writing done. If there’s one thing you hear bandied about everywhere, it’s someone self-proclaiming that they can’t write. It might be that they were traumatized by the harsh criticism of an English teacher, or that they don’t like how they sound in writing. Either way, they don’t believe they can write an ebook, and that’s simply not the case. They just need to remove the preconceived notion that they’ve built up in their minds and work up the courage to write. Following these steps will help you succeed in your efforts of writing an ebook and help you become a better writer in the long run. For more on this writing process, we’ll be taking each step and helping you through it in the next series in our blog, so stay tuned for more.